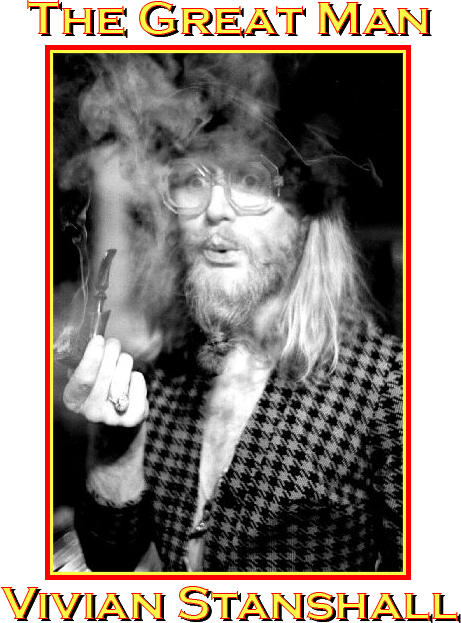 Vivian Stanshall was born Victor Anthony Stanshall on 21 March 1943. During his childhood Vivian was evacuated with his mother and had what he described as the happiest time of his life with his Mother and his voices. Voices were something for which the young Vivian had a talent. After World War II Vivian’s father returned home and the family moved back to Walthamstow. The return of his father, Victor, was a turning point in the young Vivian's life. Although his origins were working class, Vivian's father wanted his son to speak with a ‘posh’ accent which, as Vivian later noted was ‘literally bashed into him’. Consequently, he grew up living a dual life: at home, he would have to speak ‘properly’ or face a beating; and on the street he spoke with a broad cockney accent in order to avoid a beating from his peers. In 1961 he enrolled at the Central School of Art in London. It was here that Vivian and his fellow students, including Rodney Slater, Roger Ruskin Spear and Neil Innes came together to form a band which would eventually become known as ‘The Bonzo Dog Doo-Dah Band’. The band toured incessantly and recorded several albums, which led to 2 tours of the United States. Between the tours, however, something brought about a crippling change in Vivian's personality. In 1970, after six years of mounting exhaustion, they broke up, by now Vivian's life was dogged by alcoholism and panic attacks, which he tried to control with Valium. However despite his problems Vivian's continued to create and. as his friends say, never lost his edge or his wit. During the 1970’s Vivian recorded numerous sessions for BBC Radio 1's John Peel show which elaborated, with eloquence and irreverence, the surreal and bizarre goings on at the crumbling stately home Rawlinson End and the grotesques which inhabit it’s environs Ultimately, several of these were compiled and edited by Vivian to compile an LP and, in 1978, Sir Henry at Rawlinson End was released on the Charisma Records label. It featured Vivian talking and singing (as multiple characters) about the fictional history of Sir Henry Rawlinson. Puns, double-entendres, pop-cultural references and all manner of clever wordplay abounded, as Vivian takes the role of Narrator, then drifts between character and narrator thereafter. The tracks feature at least one vocal number, intermingled with spoken word performances by Vivian as both narrator and the many and various Rawlinson-related characters. The LP has been hugely influential on all comedy that has followed in its wake, most notably in the work of Stephen Fry and the alternative British comedy boom of the 80’s. In 1980 a film version starring Trevor Howard as Sir Henry, and Vivian as Hubert was released. Like the LP it was also based on the Peel recordings, but with many variations from the LP. A book of the same title by Vivian, illustrated with stills from the film, was published by Eel Pie Publishing in 1980. This book is now very rare and worth a fortune. Nominally a film novelisation, it was distilled from all the various versions of the story, including a good deal of material that was not used in the film. Aside from Rawlinson End Vivian released an album in 1980 entitled 'Teddy Boys Don't Knit' which is widely considered as the last gasp of the true counter-culture of the 1960's and stands up today as one of his greatest works. Vivian was found dead on 6 March 1995, after a fire at his Muswell Hill flat; coincidentally, this was one hundred years to the day after the death of (the original) Sir Henry Rawlinson. Despite Vivian’s relatively short life the quality of the work he left behind, be it on canvas, vinyl or celluloid, is breathtaking, innovative and truly wonderful. His legacy and integrity, as the foremost English artist of the 20th Century, remains intact.